If there’s one thing we’ve learned from the annual World Series of Poker Championship, it’s that the winner’s circle is heavily dominated by players of superior intelligence. Experience on the poker world’s greatest stage doesn’t hurt either. With such qualities in tow, Neil Blumenfield is one member of this year’s November Nine worth taking a closer look at. Hailing from San Francisco, poker was never a key focal point in Neil’s younger years, although he did play a lot in high school. After graduating from the University of California, Berkley with a Bachelor’s Degree in Political Science, Blumenfield worked his way up the industrial ladder to the esteemed position of Vice President of Professional Services at Andromedia, which was eventually acquired by Macromedia in 1999. From there, Blumenfield spent four years with another start-up company, Visigenic Software, and another 7 years with Informix Software before resuming his VP of Professional Services role with Above All Software, Inc.
Now, at 61 years of age, Blumenfield spends most of his days playing the adept role of President and Chief Operating Officer of another software company, Elastic Intelligence. 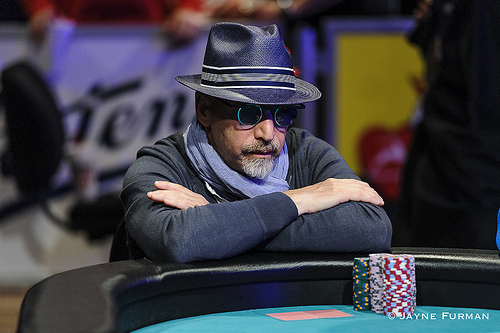 In the last few weeks, however, he’s taken a vacation from his job to reconnoiter another passion – the game of poker. Blumenfield is no stranger to the poker tables, and has been playing in tournaments throughout California and Nevada for the last 8 years. The majority have been low-stakes ventures with buy-ins of $200-$1,000, as is reflected by Neil’s total recorded winnings of $130,468 across 20 cashes since 2008. One of those cashes—the software sage’s largest to date, in fact—came at the 2012 WSOP Main Event. The San Francisco native’s deep run landed him in 285th place, worthy of a $38,453 payday. That experience was incredibly inspiring, and one Blumenfield thought would remain a highlight of his recreational poker career. Little did Neil know, just three years down the road, he would find himself holding the third largest stack of 22,000,000 going into the 2015 WSOP ‘s elite November Nine. Neil’s toughest competition will come from the current chip leader, Joe McKeehen, who possesses a dominating stack of 63,100,000; nearly 3x that of the 61 year old Blumenfield. Not only is McKeehen well ahead in the counts, he’s also considered the most experienced poker player among the 2015 November Nine. But Blumenfield has never been one to back down from adversity, as has been proven but his multiple successes with software start-up companies. He is well aware that the majority of this year’s November Nine is more experienced than himself, but he has no doubt that with his progressive knowledge and a little help from Lady Luck, he has a very good chance to come out on top. Amazingly, Neil revealed that, about a month ago, he began toying with the idea of leaving the software industry to pursue more interesting work; photography, beer brewing, perhaps even a full-time career in poker. He was unsure of whether he would be able to sustain a sizeable income as a professional poker player, but he said that thanks to his performance throughout the first 7 days of the WSOP Main Event—guaranteed to award anywhere from $1-$7.68 million—answered that question for him.